An efficient route and enough space for waste storage are often missing from commercial buildings. In 1916, the New York City Sanitation Commissioner decided that to reduce the department’s costs, the city would no longer provide collection services to commercial buildings. Forty years later, the city passed a law closing the loophole that had permitted municipal collection service for stores and other businesses located on the first floor or elsewhere in residential buildings. Since then, all commercial establishments have been required to hire licensed private carters, while the city has continued to provide municipal collection services for residential, nonprofit and institutional entities. According to the Department of Sanitation’s 2012 “Commercial Solid Waste Study and Analysis,” New York City’s commercial waste sector recycles 24% (not including organics), compared to a national average of 34.5%. Reports filed with the New York State Department of Environmental Conservation by transfer stations and recycling facilities suggest that rates for major portions of the commercial waste stream may only be between 9%–13%. ← “Private Carter Study Economic Assessment,” prepared by BuroHappold Engineering for the City of New York (2016): 77, link. This section describes specific initiatives related to these approaches. These initiatives should be considered when designing a building’s waste-management layout. The objective of DSNY Sanitations’s 2012 study and analysis was to determine both the quantity of commercial waste by stream and the amount of commercial waste being recycled at the time. The city also set out to evaluate opportunities for organic waste reduction and diversion. Because of the limited availability of data from transfer stations, commercial waste haulers and the businesses themselves, the city was only able to develop broad estimates on commercial waste composition. For the study, generation data was estimated using a per-employee model by business type. Additional information on generator and carter behavior, gathered by visually tracking curbside setout for representative street segments, didn’t include waste from containers in loading areas or construction and demolition waste. The findings for waste composition within the study show that 89% of the city’s estimated 3 million tons of commercial waste per year is suitable for recycling or organics diversion. Only 26% of that waste is currently diverted from disposal, meaning that just 29% of these recyclable or compostable materials are captured. Accountability for diverting commercial waste from landfills or waste-to-energy facilities is complicated by the number of entities responsible for specific aspects of sorting, staging, setout and collection. Tenants (waste generators), building managers, cleaning companies, waste brokers and waste haulers all play a role in the process. Waste-hauling contracts are typically based on a flat monthly fee, often estimated from square footage and building uses. Because of this, recycling and waste reduction do not always save costs, leaving businesses with little incentive to reduce waste. One reason is that there are currently limited mechanisms for tracking waste and recycling streams on a daily basis. The status quo offers significant opportunities for improvement. An analysis of private-carting operations conducted by DSNY and the Business Integrity Commission (BIC) found that collection-truck trips and consequent air-quality issues could be substantially reduced through a zoned collection, in which a single carting company would serve all businesses within the zone. A DSNY consultant is now developing the design for such a system. Through this system, DSNY hopes to be able to leverage collection efficiencies and improved diversion rates. Requirements for energy auditing and energy-efficiency retrofits for large commercial buildings have led to significant energy savings. Metering waste is not as easy, but knowing the types of materials discarded and their volumes is the first step toward reducing waste. To assist businesses in reducing food waste and diverting food discards from disposal to processing for beneficial use, DSNY is organizing annual food waste fairs through its Foundation for New York’s Strongest. The fairs offer displays of equipment for managing organics and presentations about options for managing discarded food. The first fair, held in August 2017, drew more than 1,000 attendees. Almost a third of the city’s discard stream consists of organic materials such as food scraps, food-soiled paper and yard waste. The city is taking a phased approach to requiring food-service establishments to sort these materials from other discards designated for disposal so they can be collected separately and processed for beneficial use. To reduce confusion and contamination and to increase the diversion of recyclables and organics, DSNY has aligned commercial recycling rules with residential ones. New Yorkers now must recycle the same materials at the office and out on the town that they recycle at home. The agency has also started a program to enforce commercial source-separation regulations. Given NYC’s historic lack of regulations requiring source separation for businesses, there has been little provision to date for waste-management operations in commercial buildings. DSNY’s new commercial recycling and organics-separation rules will spur better planning and implementation for these functions. For sources, see Building Rules & Standards in Appendix. Local Law 87 of 1992 made recycling mandatory for material collected by private carters. DSNY enforces its regulations under this law, which designates the materials that commercial waste generators must recycle and specifies the requirements for source separation prior to collection. There must be separate bins for refuse and recycling (which can be single-stream: metal, glass, plastic and paper combined), and all bins must be labeled. Wherever recyclables and refuse are discarded (whether in maintenance, waste-storage, staff or public spaces), there must be instructional signage indicating where specific categories of designated materials should be placed. Clear bags must be used for setting out recyclables: metal, glass, plastic, beverage cartons, paper and cardboard. Recyclables and refuse cannot be loaded into the same truck compartment for post-collection separation. Businesses generating significant proportions of textiles or yard waste (more than 10 percent of either) must sort these materials for separate collection. Designated businesses have the option to arrange for collection by a private carter, transport their organic discards themselves or process the material on-site. Permitted processing methods include composting and aerobic or anaerobic digestion (equipment must be registered with DSNY). A food waste grinder is not permitted. The current building code includes no requirements for waste management in commercial buildings. As a result, most builders do not provide sufficient space for waste management. See Chapter 4 on policy for suggested code language to address this omission. ZR 32-435 requires that plans submitted to DOB developments in high-density commercial districts show a central refuse area on the ground floor. ZR 37-94 requires a screened trash-storage area more than 50 feet from the street line be shown in the site plan for parking lots over 6,000 sq ft in commercial zones. The ZR also specifies some places where trash storage is not allowed, such as enclosed sidewalk cafés and some plazas or arcades, or where screening is required. TRUE is a zero waste certification program for facilities. The program is administered by Green Building Certification Inc. (GBCI), the certification provider for the LEED rating system of the U.S. Green Building Council (USGBC). TRUE Zero Waste Certification, given for 90% diversion of materials from landfill or incineration, is aligned with the LEED credit requirements for Buildings Operations and Maintenance (LEED O+M). See Building Standards & Certifications for more details. LEED offers credits for materials and waste management, which include prerequisites for Storage and Collection of Recyclables, and Construction and Demolition Waste Management Planning. See the LEED v4 Waste Management Credits for more details. New York City has many types of commercial buildings with a wide range of uses. That means there is a greater range of commercial waste-management issues to be addressed than there is with the city’s residential collections. In New York’s larger buildings, construction and demolition debris pile up almost continuously because renovation projects occur on a regular basis. See Construction & Demolition Waste Context. Space required: Building owners find space efficiency is desirable, especially on floors above grade. Labor required: Moving waste adds costs for a building owner. Convenience to staff: If systems are convenient and safe, staff are more likely to follow them. Cost and maintenance: Some typologies require equipment that adds capital costs and requires additional maintenance. These four concerns are interrelated—and additional convenience to the building tenants in multi-tenant buildings will generally result in increased labor costs for the building operator. Similarly, equipment may reduce labor or hauling costs but increase capital costs and maintenance requirements. Volume reduction: Compaction leads to a reduction in volumes and area required for storage and setout of waste. Diversion strategies: Ease of incorporating diversion strategies include clear visual cues and equal convenience disposal, or the ease of adding organics collection with co-located bins. For a new building, the choice of typology depends on its size and usage, along with the factors discussed above. Suitable for small single-tenant buildings, typology 1 should have some interior or exterior storage space within the lot. Typology 3 or 4 is recommended for multi-tenant buildings, as typology 2 transfers responsibility for storage to tenants, making it much more difficult to develop a consistent building-wide system. Typology 3 is suitable when waste quantities are below that which would require a compactor to be emptied weekly (see Waste Calculator); Typology 4 should be used above this threshold. In the simplest scenario, businesses bring waste straight to the sidewalk, sometimes through a sidewalk hatch. There may be some storage in wheeled bins in a backyard or within the tenant space, but trash and recycling is generally set out in bags while organics are generally brought to the curb in two- or four-wheel bins. This arrangement is typical for small restaurants and stores, which are generally in buildings with one or two stories of commercial space and sometimes a cellar below and residential apartments above. Waste can block passageways or workflow (common in restaurants). Setout is generally in bags, which can attract pests and take up more public space than would setout in rigid containers. Collection needs to be more frequent. Less convenient: Waste must be stored within the business space until allowable setup times. Safety challenge: Some heavy waste has to be brought upstairs. Diversion strategies are more difficult to implement in tight spaces that can’t accommodate central, well-designed storage space for all streams. Bins may be accommodated in convenient “semi permanent” locations throughout a space, with visual cues such as color-coded and labeled bins. Waste metering/transparent pricing by stream is possible since the individual business/tenant contracts directly with a hauler. This typology is common in multi-tenant office buildings with elevators but no shared storage space. Before being taken to the street for setout, waste is stored in the tenant area, moved by the tenant or collected by building staff at a set time in bins on dollies or tilt trucks. Floors are serviced daily via the service or passenger elevator. Facilities or cleaning staff members generally use one bin to transport all streams, so standardized procedures need to be followed to appropriately separate types of materials at the curb to avoid contamination. Setout for refuse and recyclables is typically in bags, while organics are generally set out in wheeled bins. Space efficient: Limited floor area is given over to longer-term storage. Low labor: Discards go directly to curb, and no or few setout containers are brought back into the building after collection. Bag setout can attract pests and take up more public space than rigid containers do. Inconvenience: Tenants must hold daily discards until a set time. Waste metering/transparent pricing by stream is not common but is possible if maintenance staff can weigh trash collected from each tenant space using, for example, a tilt truck equipped with a scale and digital screen. There are also technical solutions used commonly in SAYT models, in which bags include RFID or QR-coded labels that can be scanned. Some large multi-tenant buildings, such as those with office, hotel, university or retail uses, provide shared storage space. 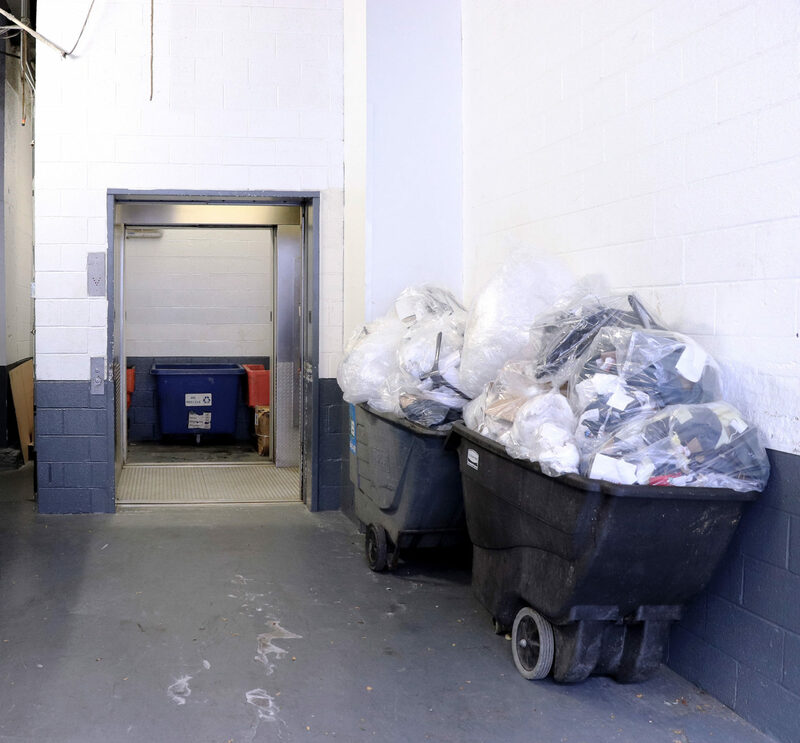 Waste is collected from tenant areas, placed in transport bins and taken by service or passenger elevator to the shared storage space where there may be balers. Waste can be brought to the storage space by building maintenance staff or tenants. Setout may be in 1–2 cu yd containers, wheeled bins or bags. Convenience: The timing of waste collection from individual tenant spaces does not have to be coordinated with waste pickup from the building. Collection can be less frequent. Space needs to be allocated for a storage area. More building labor is required to move waste from storage to curb. Volume reduction: Compaction is possible (cardboard balers are common in this scenario). Diversion strategies are easy to implement with good signage and co-location of all waste streams in the storage space. Waste metering/transparent pricing by stream is not common but is possible, for example by charging tenants on a per-bag basis. This is labor intensive as staff time is required for tracking bags. A scale solution for tracking and recording waste can be built into the storage room. There are also technical solutions used in SAYT models where bags must include RFID or QR coded labels that can be scanned. The ideal situation for large multi-tenant buildings is shared compactor-containers, which may be exterior or in an interior loading area. Waste is collected from tenant areas, placed in transport bins and taken by service elevator to the shared container compactors and other bins. Building or tenant maintenance staff can bring waste to the storage space. Automatic pressure detection can tell the hauler when the compactor is almost full and ready for collection; it is then removed by truck and returned empty. ID tags can be required for opening the compactor doors so that individual tenants can be charged for the number of times the compactor is used, or a scale can be included to charge by weight. Collection is less frequent (with reduction, there can be a significant decrease). Convenience: The timing of waste collection from individual tenant spaces does not have to be coordinated with building waste pickup. Sidewalks remain free of waste. Self-contained compactors reduce odors and mess. Space needs to be allocated in the loading area, which is in high demand in multi-tenant buildings. Waste management pickup needs to be coordinated with other building deliveries. Managing space and equipment increases labor. Volume reduction strategies are easier to implement, with compaction typical. Waste metering/transparent pricing by stream is possible but involves more technical solutions (such as compactors with key cards or mechanisms in the loading area for weighing waste).